Cooper is the newest addition to the Mark Diamond’s family. 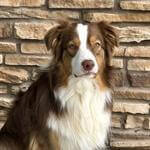 He is a New Mexico native, born in Belen to Desert Willow Aussies. He is our store greeter and a shopping companion for our guests. He’s super sweet, loves riding in the car, jumping in the air for toys and doing tricks for treats.